"I think that is yet to come. Motorsports is pretty much the most fun thing I've ever done, and I haven't lost a car or anything irreplaceable yet, so it's always been worthwhile." 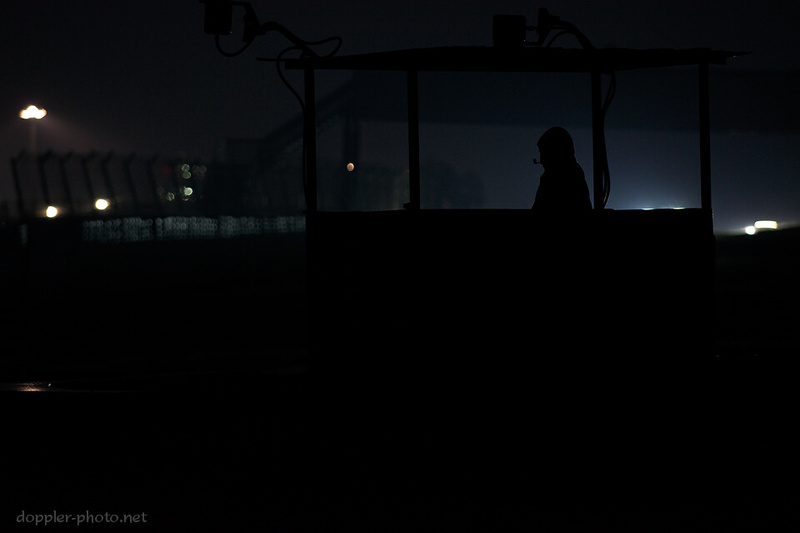 In the photo, he sits in the driver seat as the team gets everything ready for his first night-racing experience. I've mentioned in previous years that optimism alone typically doesn't get you through the night safely. It might be one piece of the puzzle, but it's still only one piece. Vehicle lighting is essential at night. Both so that the driver of a vehicle can see the track, the vehicles, and any unexpected obstacles; and also so that other drivers can see that vehicle. A stopped vehicle that has no lights (or, that has lights that aren't visible to approaching traffic) is a sitting duck, and a recipe for disaster. Lights make it possible to for the driver to see what they are approaching, and flaggers make it possible for drivers to know about situations that they can't actually see yet. For the 25-hour race, two rotations of flaggers switch off during four ~6-hour flag shifts during the race. And just like the pit lane workers, they have to bundle up and be prepared for whatever climate conditions may occur during the race. The flaggers are so important that the race pauses (full course yellow, cars circulate but no passing is allowed) during the shift changes. Spotters offer more of a competitive benefit than a safety benefit, but that competitive advantage might mean that a driver can be more conservative during stretches of the race that are more treacherous. For instance, if you can maintain position without having to dive-bomb slower cars into the corners in the rain, you're a lot more likely to avoid contact when mistakes inevitably happen. Generally, the spotters find a spot with a clear view of the track, and relay any relevant details back to the team over radio. 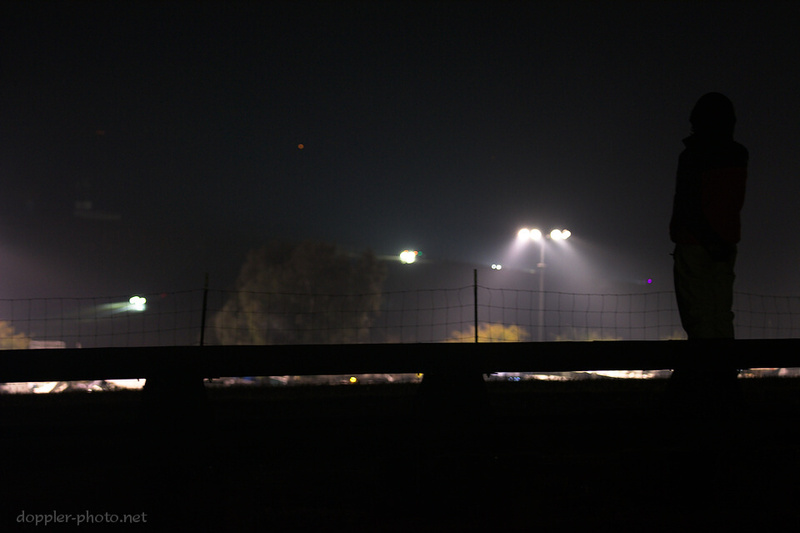 Here, a spotter stands on a hilltop bench above the back half of the track (near turn 9), and looks on as cars pass over turn 5 in the distance. 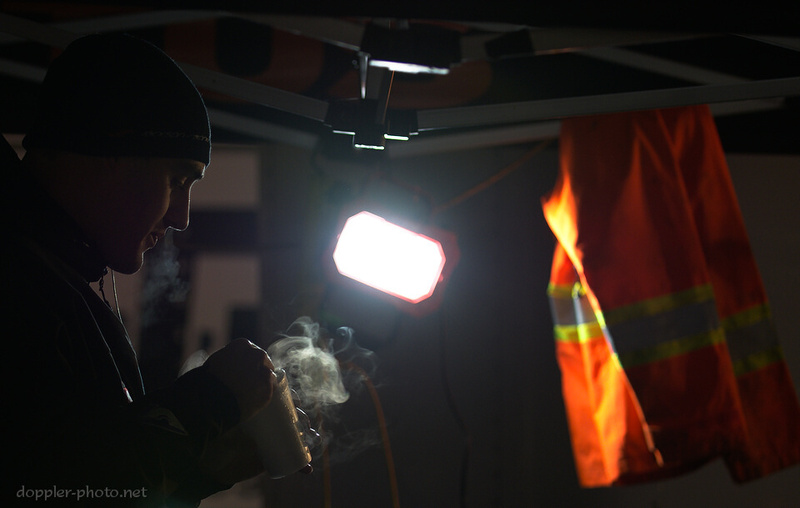 For drivers and crew, it also pays to stay warm and to avoid hunger and dehydration. The inevitable fatigue of spending dozens of hours on alert, and of dealing with a deluge of rain for half of the race, will add up on their own. Other sources of physical discomfort just make things worse. Fundamentally, endurance races are about extending that comfort as long as possible — the more comfortable you are, the better you can focus, and the less likely you are to make mistakes. The fewer mistakes you make (as driver or crew), the more time you spend turning fast laps, and the less time you spend waiting for the tow truck, or fixing things that broke. When you put enough puzzle pieces together, this is what it looks like. 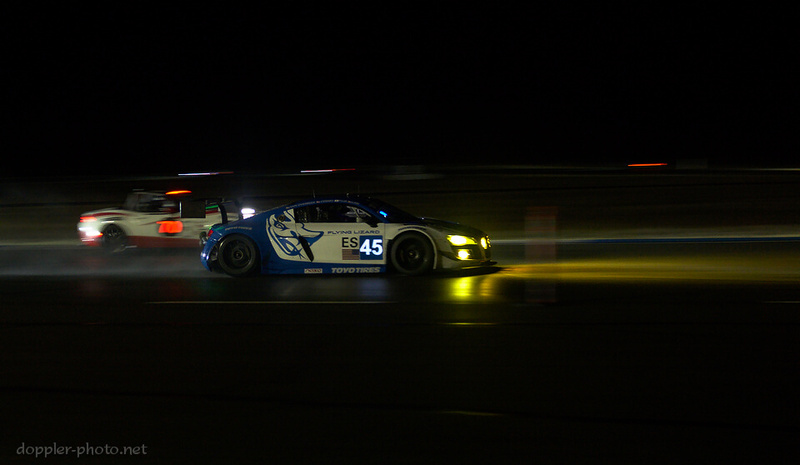 The #45 Flying Lizard Motorsports Audi R8-LMS dominated the race from sundown onward — they outlasted the faster cars (none of which made it to sunrise), and once the rain started falling, they passed other cars everywhere imaginable. Corner, straight, it didn't seem to matter. By the end, they placed first overall with a 35-lap margin over second place, and a 59-lap margin over third.